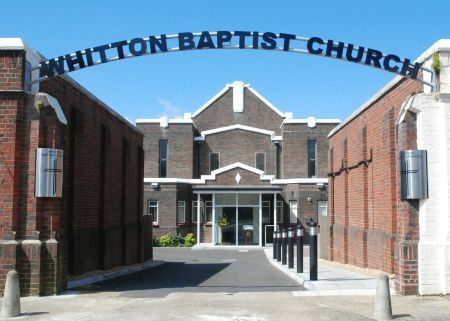 The church building is in Hounslow Road, Whitton, Twickenham, Middlesex. Few people have heard of Whitton, but most have heard of the Twickenham Rugby Ground, or Twickenham Stadium as it's now called, which is not far away. London's Heathrow airport is also not that far away and we are quite close to the flight path so when the wind is in the wrong direction our Sunday services sometimes have a few interruptions! From the road there is not much to see of the church building as the entrance is between two blocks of two shops and the building is behind the shops. Our driveway is clearly marked however by two rows of concrete bollards and a noticeboard. The nearest British Rail stations are Whitton and Hounslow stations, both are on the South Western Railway London Waterloo / Reading / Windsor line and within 10-15 minutes walk of the church (depending on how fast you walk!). From Whitton station turn right and walk along the High Street and accross the mini roundabout, we are a short distance along on the left. From Hounslow station leave the station from the platform exit on the other side to the main station building and walk forward along the road, join the main road that comes over the bridge then either get the 281 bus from the bus stop just past the car showroom and get off at the Parish Church or keep walking along the road until you pass the Parish Church and you'll see us on your right. The nearest London Underground station is Hounslow East on the Heathrow section of the Picadilly line. Come out of the station, turn left and walk along the road to the bus station then get the 281 bus and get off at the Parish Church. Walk along a short way and you'll see us on the right. The 281 passes the church, the bus stop is a couple of minutes walk away (opposite the Parish Church). The H22 stops near the roundabout at the junction of Hounslow Road and Nelson Road, walk to the roundabout and turn right. The church is a couple of minutes walk along Hounslow Road on your left. We are a few miles off junction 1 on the M3, after leaving the M3 stay on the same road (the A316) take the first exit on the first roundabout and turn right at the traffic lights, follow this road through the high street and across the mini-roundabout, the church is on the left (oposite what's left of the parade of shops). We are a bit further from Junction 3 on the M4 and the route is not as straight forward. Come off the motorway and take the A312 towards Hounslow, first exit if you're westboard, turn right and go under the motorway if you're eastbound, signposted Hounslow and Feltham. At the roundabout take the first exit onto the A4. Go straight across the next roundabout and take the right fork onto the A3006 Bath Road, at the cross road by Hounslow West station keep straight ahead on the Bath Road. At the traffic lights take the right hand filter lane and turn right into Wellington Road North, signposted Whitton, Twickenham A3063 (B358). Continue forward at the major cross road into Nelson Road go over the railway and follow the road until you get to the mini roundabout by the Admiral Nelson pub then take the first exit. We are just along the road on the left. We have a car park at the rear of our premises. 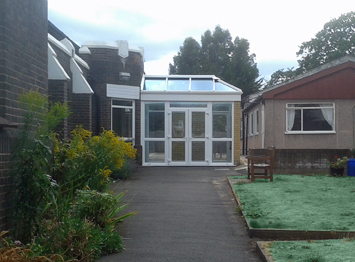 Our front entrance has level access for wheelchair users and a portable ramp is available at the rear entrance. The church has an induction loop, hearing aid users should set the hearing aid to the 'T' position. 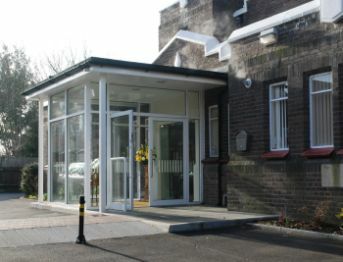 Disabled toilets are provided in both the church building and halls. If you do visit us please introduce yourself. 1943 to 1969. The vestibule was refurbished in 2018.